This mustard crusted lamb is succulent and full of flavour and is a simple and tasty dish to create. Mix 20 ml of the olive oil and 10 g of the KNORR Garlic Puree together. Drizzle potatoes with garlic oil and sprinkle with KNORR Aromat. Roast for about 60 minutes, or until crisp. 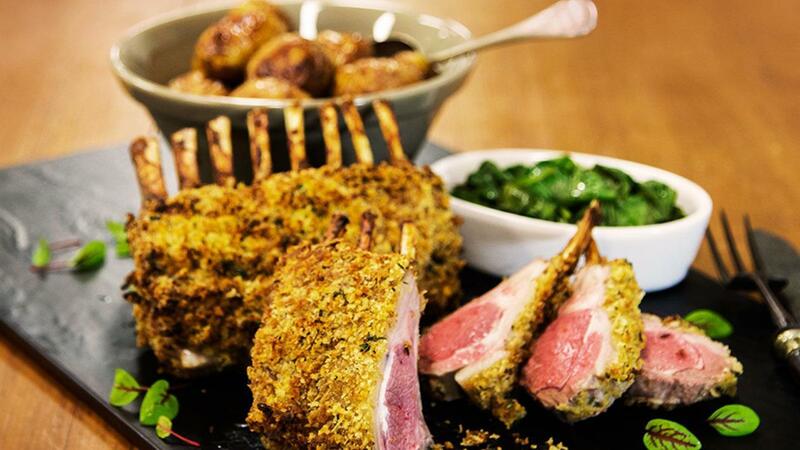 Season the lamb racks well with KNORR Beef Booster and KNORR Mixed Peppercorn Puree; drizzle with 50 ml of the olive oil. Sear the lamb on both sides in a frying pan. Spread the COLMAN'S Dijon Mustard evenly over the seared meat. Mix breadcrumbs, remaining KNORR Garlic Puree, herbs, lemon zest and remaining oil together. Pat onto the mustard so the crumbs stick. Transfer the racks to a baking tray and roast for 15-20 minutes for medium-rare. Allow the lamb to rest for 5-10 minutes before carving. Serve with the potatoes and wilted spinach, drizzled with red wine vinaigrette. Be inventive, mustard is great to use on meats as a rub or crust for added flavour!